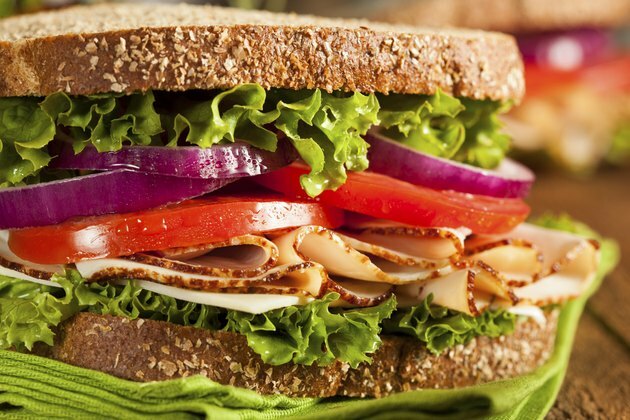 A turkey sandwich on whole-wheat bread can be low in calories and saturated fats and can be eaten more often than higher-fat choices such as cheeseburgers, tacos or other fried food. A 3-ounce serving, approximately 90 grams, of roasted breast of turkey, skin removed, has 117 calories and less than a gram of fat, according to the U.S.Department of Agriculture's Nutrient Database. Reduced-calorie wheat bread has 45 to 60 calories a slice, depending on the brand. Mayonnaise has 103 calories and nearly 12 grams of fat in 1 tablespoon. A 1/2-inch thick sliced tomato, lettuce leaves, 1 teaspoon of mustard and a slice of pickle all have negligible calories. Altogether they add 25 calories to your sandwich. To reduce overall calories in this sandwich, use light mayonnaise and 2 ounces of turkey instead of 3 ounces Add more tomato slices and lettuce. Be sure to read the labels on loaves of bread to find the wheat bread with the lowest calories per slice. Eat a piece of fruit with your sandwich instead of chips or fries, to add nutrients and keep the total calories low. Drink iced tea with no sugar or diet soda; both drinks have no calories.